The new Cura brake from Formula signals a new era for the iconic Italian brand (click to enlarge). While Formula made some of the best brakes on the market a decade ago, the latest stoppers from Shimano and SRAM are so good it’s hard to justify buying anything else. To try and help reclaim their throne, Formula has gone back to the drawing board. 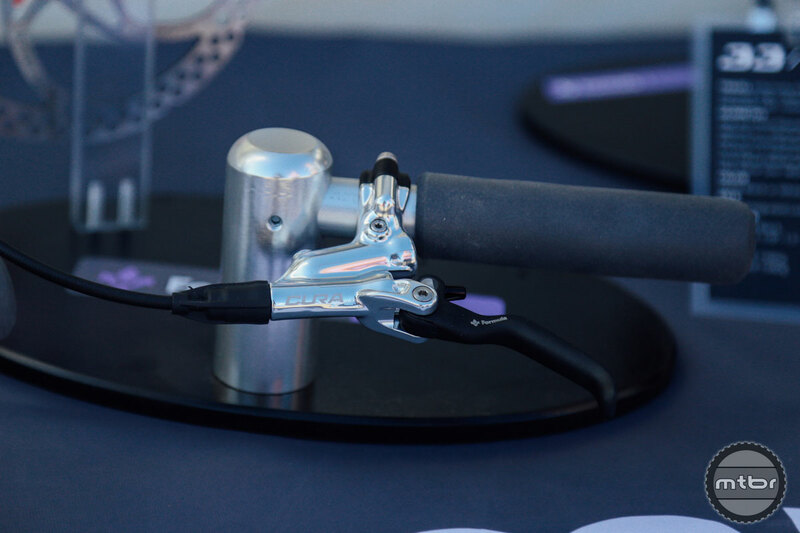 Their new brake model is called the Cura and signals the start of a new era for the Italian company. This platform uses mineral oil and introduces a new forged axial master cylinder. This redesign is claimed to offer improved modulation, a more ergonomic lever shape, and helps make bleeding easier by improving the ability of air trapped in the reservoir to escape. The Cura brakes are easy to setup regular or moto style (click to enlarge). Indeed, the Cura actually has three bleed ports. The first is used primarily to speed up production on the manufacturing floor, while the second and third allow you to service the brakes easily regardless of whether they’re set up regular or moto style. According to Formula, having this number of ports adds a negligible amount of weight, but helps make the Cura more affordable and easier to service. A prototype version of the Cura has already claimed a World Cup downhill victory in the junior ranks (click to enlarge). The caliper is a forged two piece affair with 24mm caliper pistons, similar to what’s found in the current T1 brake. Formula claims power should match any current four piston offering, but doesn’t quite offer R0 level power. As Formula continues to develop their next generation of brakes based on this platform, more features and different caliper options will be added. For now, weight for this system (including 85cm hose, 160mm one piece rotor, and steel mounting hardware) is claimed to be a respectable 359 grams. For more information visit www.rideformula.com. 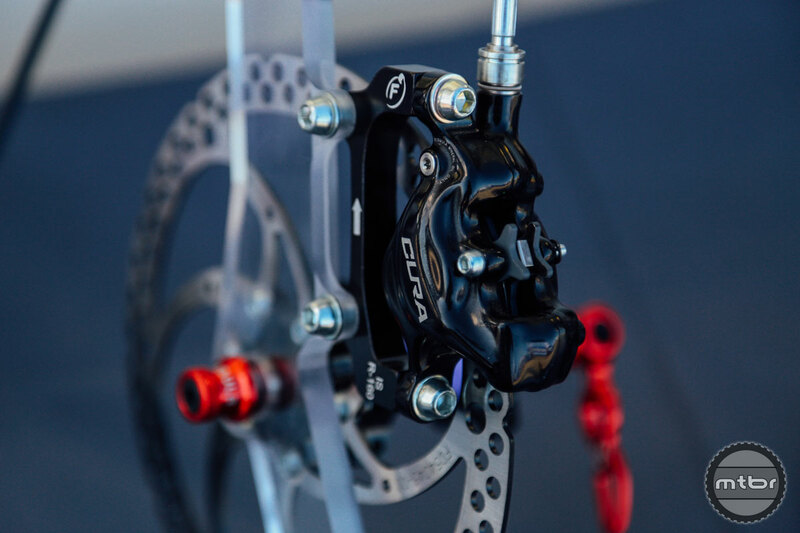 The new Cura brake from Formula signals a new era for the iconic Italian brand. 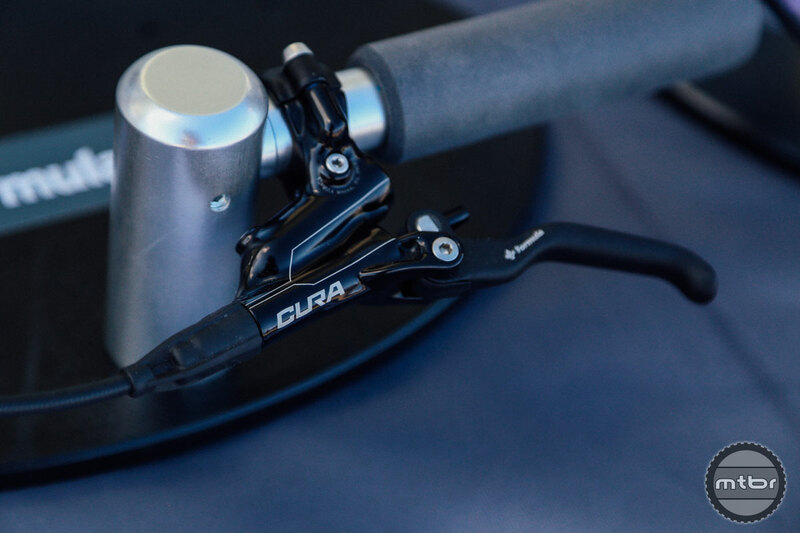 The Cura brakes are easy to setup regular or moto style. A prototype version of the Cura has already claimed a a World Cup DH victory under a junior rider.